To a very large extent South Jersey is West Jersey. In the common "8 counties" definition of South Jersey (see Definitions of South Jersey ) all but Ocean County were in the jurisdiction of West Jersey. In fact, the southernmost municipality of what is now Ocean County, (Little Egg Harbor Township), was in West Jersey at that time. The West Jersey regions north of Burlington were not thickly settled, the Delaware River was not navigable much past Burlington City and the falls of Trenton area stopped further passage altogether. 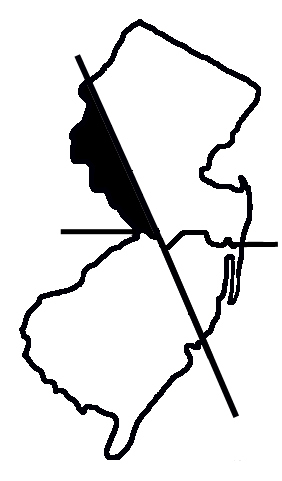 As indicated above, all of today's Ocean County was in East Jersey with the exception of Little Egg Harbor Township (which was transferred from Burlington to Ocean County in 1890). 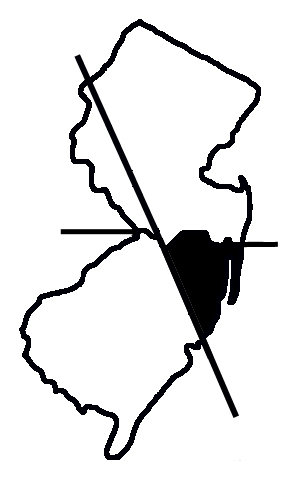 Settlement in this area was even lighter than in the northwest: as late as 1790 the population probably did not exceed 2000 (about 3 percent of the South Jersey population at that time). So the history of South Jersey up until 1703 is basically West Jersey history and some of the cultural characteristics of West Jersey's "bedrock" communities persist as a part of South Jersey heritage. A recent project on mapping what major city people affiliate with most, shows remarkable evidence that the old East Jersey/West Jersey boundary still lives in a de-facto West Jersey Consciousness . This site maintained by Bob Barnett. Last updated: 2015 Eleventh Month, 13th.